Alcoholics Anonymous Working With Others Group | Meets at 7:30 Fridays, 1 Burgundy St Heidelberg. Phone 04 6625 0202. We are an active Alcoholics Anonymous Group in the Melbourne, Australia. We hold meetings in the suburb of Heidelberg on Fridays at 7:30pm and at 10:00pm and a meeting in Glen Waverley on Sundays at 6:30pm. If you live in our area and think you have a problem with alcohol and would like some help, contact us or to come to our beginners steps discussion meeting at 7:30pm on Fridays, our Late Meeting at 10:00pm on Fridays or our Glen Waverley on Sundays at 6:30pm. We suggest you come along five minutes before the meeting starts and introduce yourself. Let us know you are new to AA. If you want to know more about Alcoholics Anonymous try the Alcoholics Anonymous Australia Website. To find other meetings in Melbourne and around Victoria, go to the AATimes website. Alcoholics Anonymous is an international fellowship of men and women who have had a drinking problem. It is non-professional, self-supporting, non-denominational, multiracial, apolitical, and available almost everywhere. There are no age or education requirements. Membership is open to anyone who wants to do something about his or her drinking problem. The Working With Group hosts the annual Melbourne AA Steps Weekend April or May. You can listen to audio from past events at the Steps Weekend website. 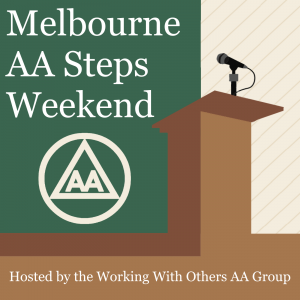 We'll be starting to plan for the 2019 Melbourne AA Steps Weekend soon. If you would like to help out, you can join our group - the Working With Others AA Group. We suggest that you subscribe to the AATimes newsletter so that you'll get notifications about this event and other AA events in Melbourne and around Australia.